Anybody have any suggestions for an English DM to replace Matic, besides Dier? James Garner? Like you'd need another short-term fix for now, but he could potentially nail it down. Otherwise Declan Rice would probably be my top recommendation. Honestly, I'd give up one of my HGN slots elsewhere on the pitch and sign a foreigner. There's just too few English players to choose from in that position. Reece oxford (train him as DM), ronaldo vieira, chalobah only ones i can think of in my head other than declan rice. James garner if not any one of those. That's the idea, but he's still not ready yet. Garner, that is. I get it, but my OCD nature likes to have at least 5 HGN players in the first team. I currently only have 3. Just a habit. What role are you using Matic in? If I knew that I could probably recommend some short-term fixes. Probably the best of the bunch though, considering we're looking for an English DM. I think he'd do a job. Lost to a near full strength Lyon side 3-1. Only had Martin Hall (who played as a Libero in my back 5 :')), Garner and an injured Angel Gomes who could play! I dunno man, I'm finding it weird that roles that are "accomplished" or below do not work at all for me and I have no idea why. I bought cook to replace matic and he sucked as a deeplying or even dm so i moved him as BBM and he was even worse and his attributes are among the best for English and overall balanced. So i use him as a deep lying support CM in rotation with gedsen and ndombele just gonna get rid of him completely and buy each player for their natural cause. Tried it with other players to see if it was an issue and they all played worse than their natural positions and having such a huge effect at the start of the game where training a certain role was almost impossible I never intended to try again. 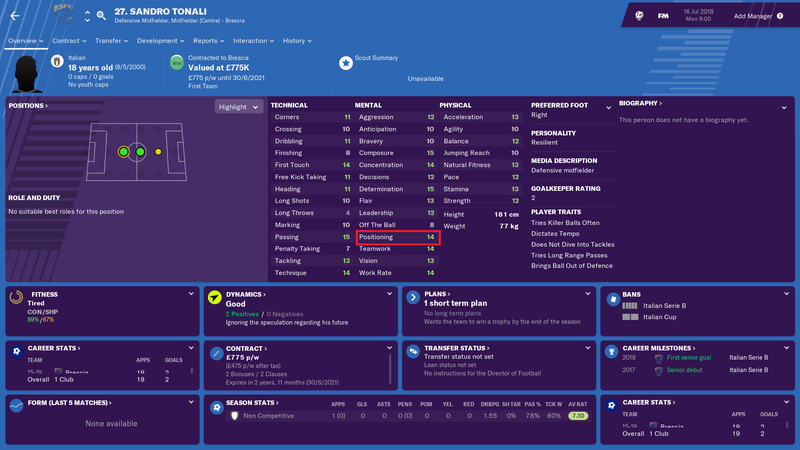 Not English but I can heartily reccomend Sandro Tonali as a DM, he was pretty much displacing Matic on my save until I got tired of fighting it out with players over new contracts every time I clicked continue. Long time lurker here, just need to vent my frustrations. Won the treble first season - Prem, FA Cup, Champions League. 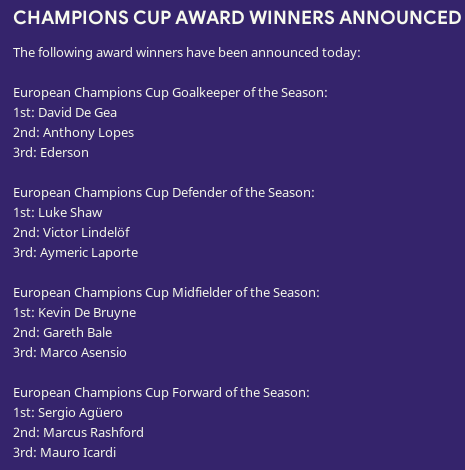 Pogba had an absolutely belting season, bagged 34 goals and won all individual awards possible. He scored two goals in our 4-0 demolition of PSG in the Champions League final, but of course they come knocking and he wants to leave. I foolishly tried to get £200m out of PSG, they quickly withdrew and Paul was upset that I "priced him out of a move". When we had a chat there was no option to say he's an influential member of the team and I can't lose him, so by the time we'd finished talking he was done with me. He handed in a transfer request, which was rejected in hope that it would all blow over, but then a week later did the same. I had no option but to accept his request and see how much I could get for him. 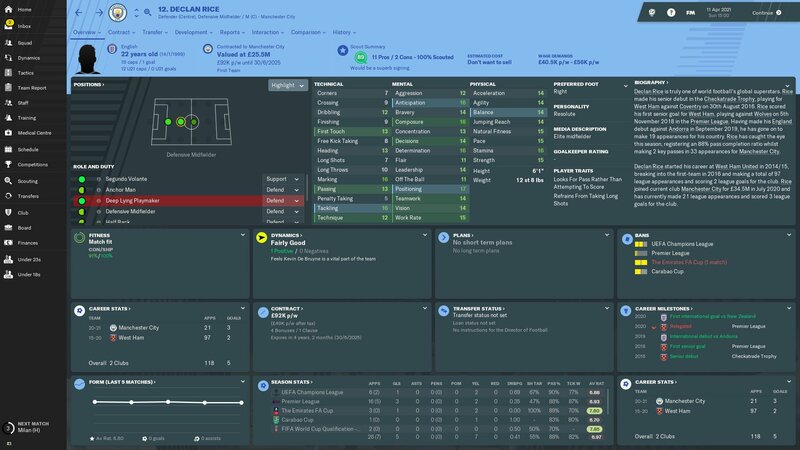 So the new season draws near, and I'm limiting him to Under 23 matches only - I refuse to have him play in my team if he wants out. When it comes to selecting my captain and vice captain, a change is needed. Paul is currently vice captain behind Ander Herrera, and as he wants to leave, Matthijs de Ligt is appointed our new vice captain. Transfer windows come to an end around Europe and no one has made an offer for Paul. He asks me to remove him from the transfer list - sure, no problem, let's put it all behind us and move forward. Two days later - he's angry that the vice captaincy was taken away from him. Are you joking? You handed in a transfer request you moron, why would I want you to be vice captain of the squad? 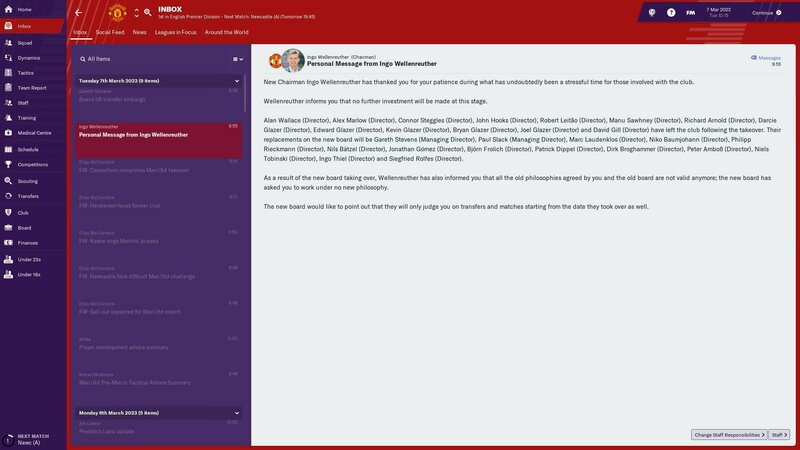 Of course when it came to explaining why I removed the vice captaincy from him, there was no option to say "it was taken from you as you were transfer listed by request at the time" and I've again angered him further by just suggesting that he gets on with it. So the new season draws near, and I'm limiting him to Under 23 matches only - I refuse to have him play in my team if he wants out. When it comes to selecting my captain and vice﻿ captain, a change is needed. Paul is currently vice captain behind﻿ Ander Herrera, and as he wants to leave, Matthijs de Ligt is appointed our new vice captain. Bang on the same thing that happened with me and Pogba. 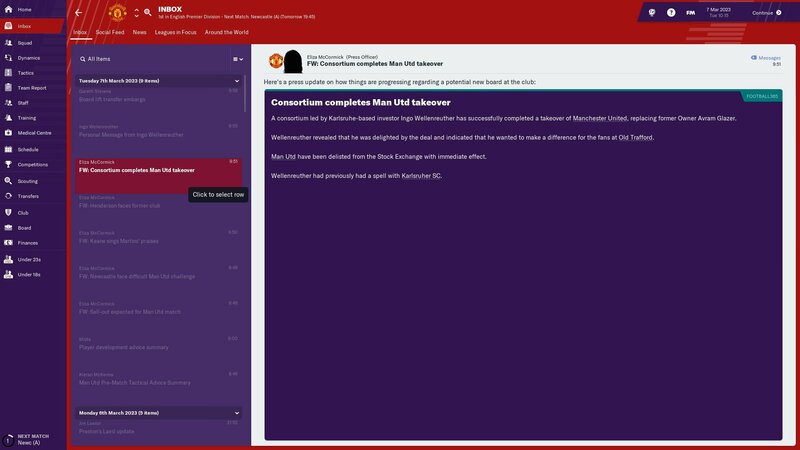 Its one of the main reasons I have chinned off FM19 as you just cannot argue with batpoop crazy. IMHO, the interaction and dynamics is currently one of the worst things about FM, until they can code context it should be out of the door. Right now it's a huge part of the game, as it should be to be honest, but without the intelligence and subtlety that it needs. You're not wrong, for a top level club like United I'd refuse to have my main holding midfielder have below 15 Positioning (of course sometimes I don't use one, as in the tactic I used when I posted in this thread). 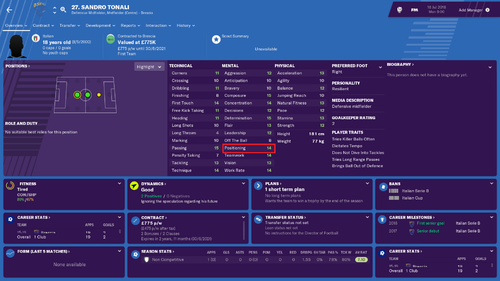 I've never bought him but the way I see it Tonali is an investment in potential, if players still developed like previous FMs (i.e. uniformly, and rapidly if tutored right) you'd have his Positioning at 15 within two seasons easy. As is, he's the sort of player that can fill in well as a backup for a couple of seasons but then would need regular football to get to the right level. I diversify his role depending on who's in front of him. Mostly I play him as a Defensive Midfielder on support. I played him in a couple of cup games and he was outstanding, I then picked him for a weakened league side and he was again outstanding. His development was out of this world to be honest with you, I think by the end of the first season I had gotten his posistioning up to 14. His composure and passing ability are fantastic. To be honest, I think he is one of those players in FM that just works even though his stats might not suggest he is that good. Well yeah the likes of Lewis Cook, Tonali are the wrong players for that role. Declan Rice sounds like the only English one who would do it tbh. Fair enough, I think he was bought by inter on my save so i'll let it slide for now and pretty much the same as I do, lowest i'd go is 14. After my first season using matic and cook/herrera im trying to add fosu back into the mix and i'd say he's alot more comfortable but im really hating 19 atm so i can't bring myself another season of it, especially when i tried signing lozano having a really high interest and then suddenly going to his manager to get a contract signed, same happened with everton the Brazilian so I had to stick with just thauvin and stick lingard on the left in rotation with martial. I'd expect so but i've barely seen any of my players go up by 2 or more since being at the club for a year per each stat. Only gomes has gone up by 3 in technical attributes because i set u23 training for a week in every month. I might just double save and simulate it into about 3 years and see how far he gets with the shortlist of wonderkids. Attributes are all right in going up but seeing the likes of the best players under scoring has really put me off the game. I tried to sign him this summer but he chose City over me, he looks very good and well suited to being a DLP at DM. how he's valued at 25.5 as an elite midfielder with those attributes is beyond me. DM role would suit him better cause his technique is poor but nevertheless great in all DM roles apart from regista. They signed him for £34.5m in the summer and he's played consistently for them so god knows why his value is so low. His positioning at the start of the game is at 14, so by no means awful, probably one of the best in the game at his age. Positioning 14 on a newly loaded game. This is after the winter update so may have been 10 before the update but its 14 at the start now. Wow apologies to anyone I said otherwise, fair play looks even more the beast. Maybe they had a bug with him being 14 but it showed up as 10 making him look greater than what it showed. More likely he just got adjusted for the update. Had a really bad run of fixtures in terms of where they were situated on the calendar, 1 day break between each of my last 3 Prem Games. I will look at bringing in more backup especially in the full back areas. Transfer embargo enforced...changes are afoot! I hate it when they block it, my earlier story was close to the transfer window so I had to do business all in one day and put one day deadlines to close it in lol. Is the 70m inves even that big?? Loooool. More modest budget? Are you kidding me????! Is there a hidden rule in this game regarding PSG and Man United transfers? I tried to sign Neves, PSG chimed in during the contract negotiation and signed him up for less. Moved for Skriniar. I scouted for the entire season, offered him a contract, PSG signed him up for less again. I've now moved for Alex Telles, and they're doing it again? By the rate of things, I will lose all my main targets to PSG. So, any suggestions on a CB with stats similar to Skriniar, for 70m? Napoli asked for 130m for Koulibaly so that's a no-no, and don't even mention Bailly. 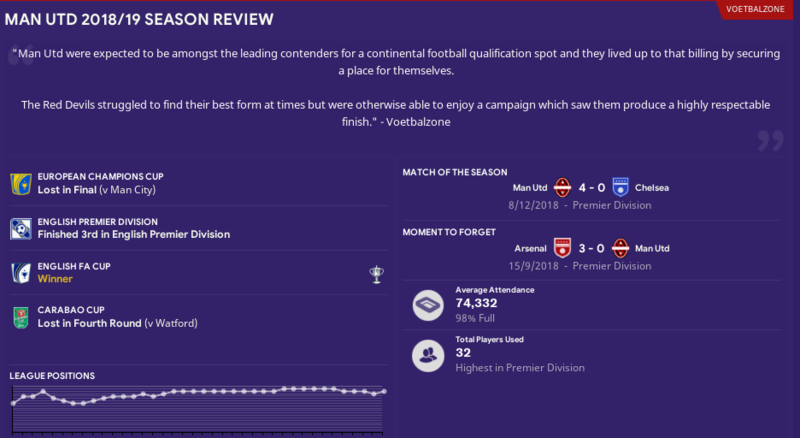 Man conceded a penalty that lost me the game in the semis of the FA cup, then scored two own goals and made the mistake for the third in the UCL final. Karius would be tipping his hat. Hoping for someone with as similar stats as it gets. In general the enemy AI will always be able to get cheaper contracts than you are able to. Just make sure you try to sign some high profile, but 2nd choice (for you) players and let PSG get them (they seem to be triggered by your moves). Then, sign the player you actually want. Ruben Dias might be a good signing for you btw. Moved to Spurs in Jan. Liverpool even signed Umtiti while I was dozing ffs. I feel like Woodward. Gonna make a big push for Koulibaly, but that's unlikely. Ruben dias, Romagnoli (fairly cheap seems to be around 40m mark), manolas but less of a ball player, Umtiti- he's gone as you said, also check varane it's possible he can go for 60m which is dirt cheap, Sule, rugani, Jose Gimnez can go around 40m mark too but his attributes seem less than what you see in reality, godin maybe a very short term option, pavard, lenglet, miltao. Scout them all as they're some negatives that could be vital to not getting them just incase. @ShadowEdSide no current investment, but how's the debts? If they've cleared those I think you'll be able to blow PSG out of the water financially. 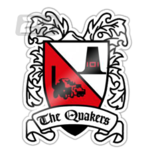 Looking for that big tackler, with a good aerial presence, and some key mental stats. Given the modern game, gotta have some good Ball playing ability as well. So far, players who met that category are Koulibaly, Skriniar, and maybe Varane. Skriniar is out. So I'm left with two. Although nowhere near as good, Maguire fits the bill, but not really sure if that's an upgrade. Militao or Pavard is who I'm looking at as the next partner for my defence, replacing Lindelof. Maybe in the future. Right now, he's not quite ready. Not many big tacklers around until you buy and improve their stats, not sure why bailly aint that good on these fm's anymore with his attributes. Rugani, romagnoli and gimnez seem to fit your bill quite well. @MatthewS17 you're going to have to develop them, but Nikola Milenkovic from Fiorentina stands out as the perfect compliment to the likes of Lindelöf or Pavard, or for a slightly lower budget Gianluca Mancini. Or given you were looking at Skriniar, how about De Vrij? Axel Tuanzebe seems more of the intelligent type, would be a good backup to Lindelöf.